I’ve just moved from Ontario out to BC (Kamloops) and unfortunately the cherry tree in the yard some sort of growth on the side of it. I’m not much of a gardener but I have been on the Toronto master gardeners site from time to time previously and have been overwhelmed with how helpful you have been in the past. I’ve uploaded a picture to give you a better feel for what I am looking at. The green discoloration appears to be something organic so I am thinking a mold, but the open wet part in the middle is what really has me concerned. If someone with experience with cherry tree has any idea what I’m looking at and what can be done to help rectify this I would be overwhelmingly appreciative. Your cherry tree has a condition called Gummosis- which is sap from inside the tree flowing out through a perforation in the bark and down the trunk. Gummosis is not a disease but rather a symptom of some type of injury to the tree. The trunk may have been damaged by sunscald (particularly if the sap originates from the south west side of the trunk), improper pruning (where a branch has been pruned too close or ripped off, damaging the trunk) disease (fungal infections such as Cytospora Canker or Phytophthora), insects (such as Shot hole borer aka Xyleborinus saxeseni or Peach tree borers aka Synanthedon exitiosa), or cultural problems (related to growing conditions). If you look closely at your tree and its growing conditions you maybe able to solve the mystery. If its too difficult, a certified arborist in your area will be able to help. You may find clues on or around your tree that help you identify the problem. Look for holes in the trunk left by borer type insects, or ‘frass’- the sawdust looking powder that gets pushed out of the tunnels made by borers. For further information I’ve added a Toronto Master Gardener link to a similar Cherry tree borer question. Are there any signs of fungal infection? Do the leaves look normal or are they distorted or discoloured? Are there any unusual growths on the stems? Check the growing conditions around your tree. If its planted in a sunny location with well drained soil then your tree shouldn’t require extra fertilizer. You could add some organic compost around the base, but not against the trunk, to add some slow release nitrogen and micronutrients to the soil if it looks like its low in organic matter. Does you tree get enough water? Cherry trees don’t like low lying areas with wet soils, but they also don’t like long periods without water. Your tree obviously grew well for many years, so have conditions changed recently? 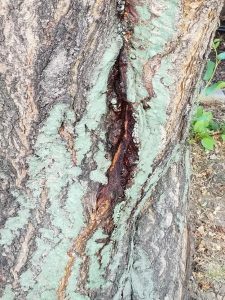 The mold looking growth on the trunk is most likely lichen, which will not harm your tree and could be an indicator that your tree is in decline, not receiving enough sunlight (Cherry trees like 8 hours a day of sun exposure) or generally stressed.